Students are encouraged to participate in school-sponsored athletics. As a student athlete, you are expected to have a commitment to the sport, the team and the school. You are expected to attend and work hard at practices. You are expected to maintain eligibility and a positive attitude. All completed forms should be returned to the Student Accounts Office. 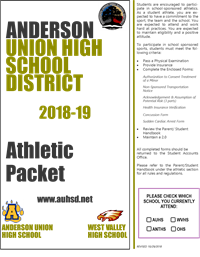 Please refer to the Parent/Student Handbook under the athletic section for all rules and regulations.